← Do employers encourage too much driving? Are the new suburban ‘supercentres’ attracting residents? The credibility of the six new suburban ‘supercentres’ announced by the Victorian Government in October 2008 has been undermined by a recent Government report on land supply. The Government announced in October 2008 that it was upgrading six existing suburban Principal Activity Centres (PAC) to Central Activities District (CAD) status. The CADs are a new top-level category of centre intended to provide “significant CBD-type jobs and services” in the suburbs. Described as “mini CBDs” by The Age and envisaged to have a mix of business, residential and civic uses, the six designated CADs are Broadmeadows, Box Hill, Dandenong, Footscray, Frankston and Ringwood. I’ve previously pointed out there’s little evidence that any “science” was applied to the selection of the CADs. It seems the Government picked six centres under the existing Transit Cities Program and designated them as CADs. They do not appear to be natural centres of commerce or industry. Only one of the six CADs (Box Hill) ranks among the nine largest suburban centres in terms of job numbers. Now the 2009 Annual Report on the Urban Development Program issued earlier this year by the planning department shows that the CADs aren’t the preferred location of residents or developers, either. The accompanying graph indicates the number of dwellings recently built, under construction, or planned, in major suburban activity centres. 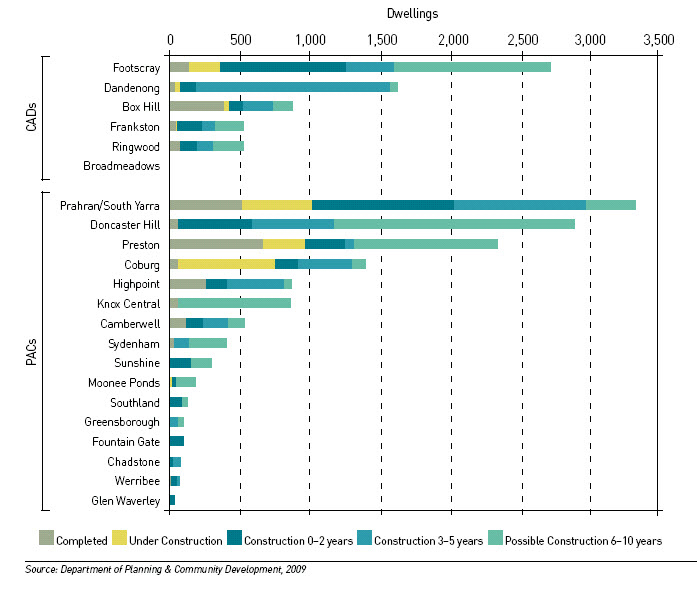 It can be seen that three Principal Activity Centres – Prahran/Sth Yarra, Preston and Coburg – all have more dwellings either recently built or currently under construction than any of the CADs. Moreover, Highpoint has done better than four of the CADs. Footscray and Box Hill are the only CADs that the market has shown strong interest in. Dwelling forecasts for 3-5 years and 6-10 years out must necessarily be highly speculative, but construction forecasts over the next two years are likely to be informed by current deal-making and planning activity and hence be less uncertain. If the latter forecasts are considered, Doncaster Hill is expected to do better than Box Hill. Broadmeadows is of particular concern, as despite its CAD status, it has no past, current or planned residential activity whatsoever. Nor is it attractive to business – it is the 25th largest suburban centre out of 31, with only a quarter as many jobs as the average size suburban centre. This is worrying as Broadmeadows has been the focus of considerable pump-priming. According to The Age, recent and current works include new Council premises, a Global Learning Centre, a leisure centre, a secondary school, a tree-lined extension of Main St, an upgrade of the railway station and a parking station. There’s a planned seven level office building intended to accommodate public servants. Notwithstanding all this government-related activity, there’s little evidence that the private sector – either residential developers or businesses – have much interest in locating in Broadmeadows. It seems that the demand for multi-unit housing in the suburbs is largely focussed on areas that are still reasonably close to the CBD, around about 10 km distant. The inner suburban municipalities of Maribyrnong, Moonee Valley, Darebin, Moreland and Boroondara have especially large shares of dwellings that have been recently completed or are under construction. In the middle ring suburbs, the municipality of Monash, which has the biggest concentration of jobs in the suburbs (Clayton), also has the largest number of dwellings recently completed and under construction. Clayton is not designated as a CAD even though it has three times as many jobs as Box Hill, seven times as many as Dandenong and fifteen times as many as Broadmeadows. The Government would be wise to examine closely the evident disconnect between (some of) the suburban centres designated as CADs and where residents and businesses have indicated they prefer to go. It could also be useful to look at how policy on the CBD is impacting the prospects for the CADs and other suburban centres.